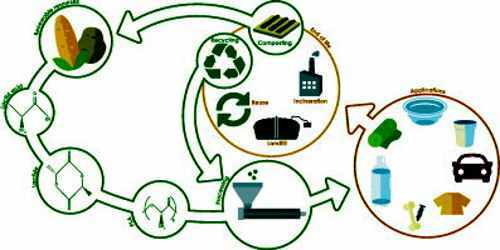 Polylactic acid (PLA) is biodegradable and has characteristics similar to polypropylene (PP), polyethylene (PE), or polystyrene (PS). It is a type of plastic that is used in building models and prototypes of solid objects and components. It is thermoplastic polyester that serves as the raw material in 3-D printing or additive manufacturing processes and applications. The name “polylactic acid” does not comply with IUPAC standard nomenclature, and is potentially ambiguous or confusing, because PLA is not a polyacid (polyelectrolyte), but rather polyester. Polylactic acid can be transformed by spinning into filaments for subsequent fabrication of desirable textile structures. Spinning may be accomplished by various routes, each with its merits and demerits. 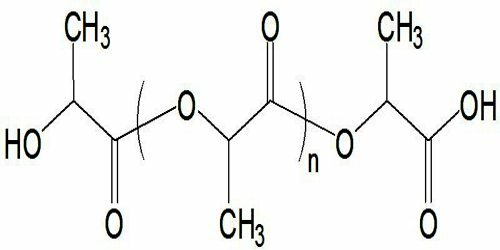 The medical applications of this polymer arise from its biocompatibility: the degradation product, lactic acid, is metabolically innocuous. The fibers may be fabricated into various forms and may be used for implants and other surgical applications such as sutures. Tissue engineering is the most recent domain where poly (lactic acid) is being used and is found to be one of the most favorable matrix materials. 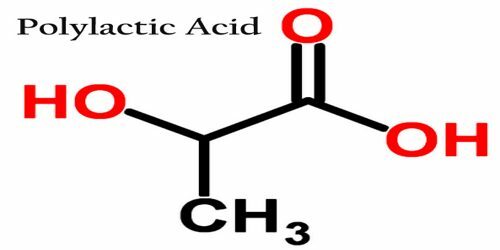 There are two methods for manufacturing polylactic acid (PLA) from lactic acid: the first method uses the cyclic lactic acid dimer called lactide as an intermediate stage; the second method is direct polymerization of lactic acid. 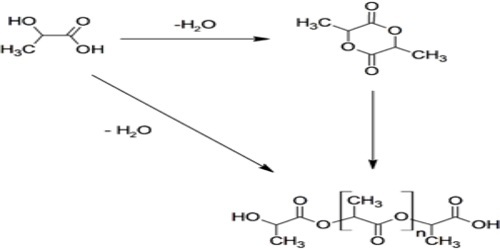 The method using the lactide intermediary yields polylactic acid (PLA) with greater molecular weight. Another route to PLA is the direct condensation of lactic acid monomers. This process needs to be carried out at less than 200 °C; above that temperature, the entropically favored lactide monomer is generated. This reaction generates one equivalent of water for every condensation (esterification) step, and that is undesirable because water causes chain-transfer leading to low molecular weight material. The direct condensation is thus performed in a stepwise fashion, where lactic acid is first oligomerized to PLA oligomers. Polylactic Acid is classified as a “thermoplastic” polyester (as opposed to “thermoset”), and the name has to do with the way the plastic responds to heat. Thermoplastic materials become liquid at their melting point (150-160 degrees Celsius in the case of PLA). A major useful attribute about thermoplastics is that they can be heated to their melting point, cooled, and reheated again without significant degradation. Instead of burning, thermoplastics like Polylactic Acid liquefy, which allows them to be easily injection molded and then subsequently recycled. There are vast arrays of applications for Polylactic Acid (PLA). Some of the most common uses include plastic films, bottles, and biodegradable medical devices. PLA constricts under heat and is thereby suitable for use as a shrink wrap material. Additionally, the ease with which Polylactic Acid melts allows for some interesting applications in 3D printing. On the other hand, its low glass transition temperature makes many types of PLA unsuitable to hold hot liquid. Polylactic acid is primarily created using renewable or green sources such as sugar cane, starch and corn. As a result, it can easily be recycled. It is used in most additive manufacturing processes that design 3-D models and prototypes through plastic-based materials. In fused deposition modeling (FDM) technology, the molten polymer filament, which is extruded from the controller nozzle, is polylactic acid.